Michigan’s Ross School of Business received a $50 million gift on Wednesday from real estate developer and alumnus Stephen Ross — boosting further a buoyant fundraising scene at elite US business schools. The donation is the latest in a string of high-profile, philanthropic donations at top schools. This year, Fisk Johnson donated $150 million to Cornell University’s Johnson School of Business, establishing the Cornell College of Business. Stanford Graduate School of Business received a $150 million donation from Robert and Dorothy King in 2011. David Booth provided a $300 million naming gift in 1997 to the University of Chicago’s Booth School of Business. The majority of the Michigan Ross donation will support career development; action-based learning experiences, such as student-run investment funds and new business ventures; and resources for attracting and developing faculty. Stephen continues to be the single largest donor to the business school, which was named after him in 2004 after he pledged $100 million and bought himself a legacy. In total, he has contributed $378 million to the school. His donations have helped Michigan Ross become one of the best schools in the world and have physically transformed the landscape of the wider university. “It gives me enormous joy to continue to give back to the University of Michigan, an institution that had such a profound impact on my life,” Stephen said. “I am extremely proud of the physical transformation we have achieved at the business school, creating modern, new facilities, and places students and facility and future leaders can thrive. A $16 million Student Success initiative that will help students develop professional skills, build a robust network, personalize their learning, and access career opportunities with leading companies around the globe. A $16 million Stephen Ross Faculty Support Fund for faculty who develop academic innovations that advance the school's commitment to action-based learning, interdisciplinary education and leadership development. The fund will also support expanded mentoring and coaching for junior faculty, which will help Michigan Ross attract and retain rising stars in business education. An $8 million Stephen Ross Student Investment Fund for academic programs and learning experiences in asset and investment management, including venture capital, private equity, commercial real estate and publicly-traded securities. 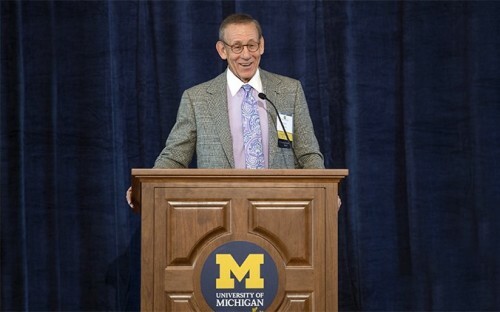 “Stephen M. Ross continues to make a tremendous impact on the University of Michigan. His generosity and outstanding leadership have transformed the learning environment for our students,” said the university’s president, Mark Schlissel. “With this latest gift, he further advances our mission, pushing us past our ambitious goal of $1 billion for student support in the Victors for Michigan campaign. In previous donations to the university, Stephen gave $200 million in 2013: $100 million for the Stephen Ross athletic campus, and $100 million to further develop a collaborative learning environment on the Ross School campus. In 2004, Stephen gave a historic $100 million gift to radically update the facilities and endow operations for the business school, which was renamed the Stephen M. Ross School of Business. Stephen is a philanthropist and chairman and founder of Related Companies, one of the world's most prominent private real estate developers. Related Companies is best known for the development of Time Warner Center in New York City. He is also the owner of the Miami Dolphins.